On the morning of the second performance of Living Wisdom School’s Dalai Lama play, I arrived an hour early. Having had long experience with the annual plays, I was confident that the behind-stage scenes would be almost as colorful and interesting as the production itself. And I wasn’t disappointed. 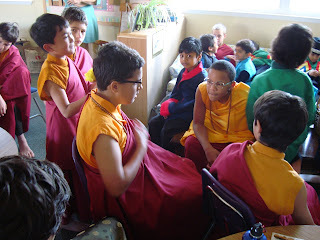 When I climbed the stairs to the second-floor classroom of the new school building, I found a group of young Tibetan nuns in costume, quietly absorbed in a story that was being read by an older student. 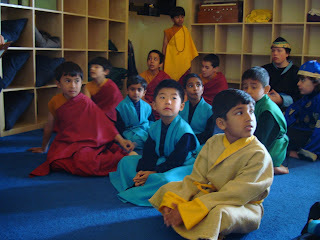 Young monks relax, 10 minutes before the opening curtain, while teacher Mathew Sloan talks about the qualities of a successful actor —poise, confidence, focus, and relaxation. In this photo, drama teacher Mathew Sloan leads the children in a rafter-shaking, rousing song about positive attitudes and joy. 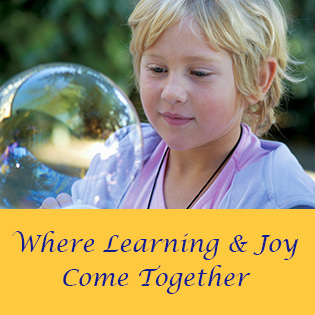 Adults who are familiar with Living Wisdom School are forever commenting about the differences with their own early school years. I can tell you for sure that in my own grade school, there would have been a certain restlessness while we sang the essentially meaningless songs of the day —Old McDonald, She’ll Be Coming ‘Round about spiritual attitudes that are very real and meaningful. Below, the young Lhamo Dhondup is formally recognized as the reincarnation of the 13th Dalai Lama, Thubten Gyatso. In this scene, he successfully passes his examination by a panel of senior monks, by correctly choosing among an assortment of objects the possessions of his former incarnation. The Dalai Lama is believed to be the rebirth of a long line of teachers who descend from the bodhisattva (enlightened being) Avalokitesvara. His Holiness is revered as the latest reincarnation of a series of spiritual leaders who have chosen to be reborn for the purpose of enlightening others. In this photo, the Dalai La	ma, in his late teens, conducts the funeral ceremony for his father, the head of a farming family in northeastern Tibet. 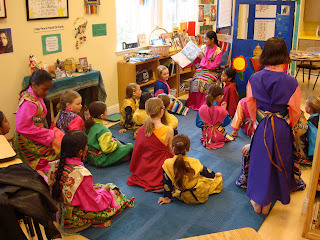 “The play is part of the landscape of learning that is offered to the children in our school. They are learning about art, they’re reading poetry, studying geography, and placing it all in space and time, in abstraction and concreteness. The theater experience is completely vivid to them —it enables the children to make endless fresh connections. It’s the deepest kind of learning. It isn’t isolated from traditional academic classroom work. But it’s experiential, and its lessons go bone-deep. “The teens are a time when children naturally want to find people they can look up to. They want heroes…. In our school, we introduce them to hero figures primarily through the all-school theater production, where each child in the school takes part. 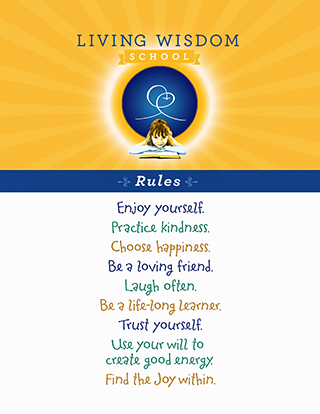 “The students are learning about a specific period and the life of a great soul such as Buddha, Christ, Krishna, Moses, Kwan Yin, Rumi, or St. Francis. As the play approaches, we go deeply into the history, culture, and thought of the period, as well as the teachings of the subject of the play. The students’ lines are the words of great souls. So it’s experiential. “While preparing for the play, they have many hours of instruction in how to act their part. We give them tremendous support. But, come performance, the bottom line is that I won’t be there. So it’s an intense, real experience that challenges them to draw on something within themselves to put on four performances to an audience of several hundred adults, teachers, and students from visiting schools.